The MLCO Proletarian Way is a Maoist organization in France founded in the late 1970s around the criticism of the dogmatism and spontaneity of a part of the French Maoist movement from May 68. Since then it is working to develop a communist policy towards the proletariat and the working class of France radically at odds with revisionism and reformism. 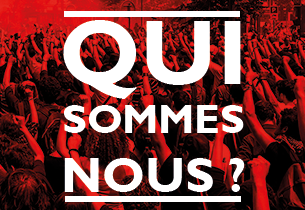 its strategic objective is the regrouping of the workers’ and proletarian vanguard with a view to the reconstruction of a truly communist party in France. Your organisation follows and joined the demonstration since it has started. Who were the yellow vest protesters at the beginning and what was the role of the trade unions ? To be honest, we joined the movement one week after the first day of action on November 17th. We must admit that we were a little surprised by the massive character of the mobilization of November 17, and by its specificities. Initially this movement is difficult to define. Yellow vests are people who are not in political or trade union organizations, rural people or in small or medium-sized cities. Socially it is varied : the working class is mobilized of course, but with other social layers, such as small-employers (craftsmen and tradesmen) or independents. Besides the fact that the opposition to the tax on fuel is unanimous, the level of claims are also very varied. In fact, a movement like this is quite unusual in France. And the unions are totally absent from the first days of actions and demonstrations. After a while the number of the protesters started to increase. How do you explain this spontaneous explosion of the people on the streets ? The mobilization is massive from the beginning : 300,000 people on November 17th according to the bourgeois press, but surely much more in view of the number of blocking points recorded throughout the country. For us, the success of the movement can be explained mainly by two aspects : the worsening of the living conditions and Marcon’s disregard for the working class since his election. The economic crisis is still there. This is not new, but the effects are felt more and more. For the workers and the proletarians of course, these are the first affected. But now it also affects other social parts, as a part of the small-employer or the petty wage-earning bourgeoisie who has mobilized itself. The other aspect is Macron’s attitude ; for many, it is the "president of the rich", the one who suppressed the ISF (tax on large fortunes). And clearly the tax on fuel disguised as an ecological measure was the last straw that broke the camel’s back. That the government wants to pay the ecological crisis to those who can not make ends meet, it did not happen at all. Can you also tell us if the migrant (workers) are also involved in these actions, and how do you deal with the racist, rightist groups in the demonstrations ? As far as we know, undocumented collectives are not involved in the movement. As far as the farright groups are concerned, we did not directly confront them. We have not crossed paths already, and in the big cities we had made the choice to intervene in processions identified as progressive. In Paris, for example, we walked alongside the railway workers and the Adama collective. In any case, in several cities, the fascists were removed from the processions by antifascist militants, or simply by demonstrators who refused their presence, this is very positive ! However, racism, chauvinism or the manifestations of other oppressions such as sexism or homophobia were not only the result of the extreme right organized in this mobilization. When we faced them, we fought them by opposing our revolutionary and internationalist slogans. And for that we relied on progressive and revolutionary forces when they were around us. It is the people who voted just a year ago for Macron. How did it come this far with the reactions of the people after just 1,5 year of ruling the country ? We had a campaign to boycott the last elections. It should be noted that a large number did not vote for Macron, or did not vote at all. Only 40% of registrants voted Macron and more than 30% abstained, voted blank or void. We can not say either that the Macron program has convinced in social layers that we find today with a yellow vest, on the contrary ! And then, voting once every 5 years has also never prevent the opressed class to mobilize. We know that in essence the demonstrations are about the life conditions witch are going bacwards, but there’s also a lot of concrete demands. Macron « claimed » to fullfil some of the demands but the people are continuing the protests. In the past demonstrations were ending after the kind of situations, even if the conditions were in general still bad . What makes the difference today ? Besides the fuel tax, Macron has not really retreated and the measures announced are really crumbs. The increase in the activity premium was already planned, other measures are downright disguised gifts for the employers ! Clearly mobilized people are not fooled, the account is not there ! Secondly, since its inception, this movement has completely abandonned the reformist organizations (including the unions). In general, social mobilizations are those forces that direct the movement, that limit and channel it, that find a "realistic" way out of which capitalism can cope. The working class in the movement do not care about creating "realistic" demands, but to just fight for their needs. The relation to violence in the movement also shows it quite well. Trade unions and other reformist organizations strongly condemn violence, the "breakers". But in the processions there is a broad agreement to say that the peoples violence that emanates from the demonstrations is not much compared to the social and economic violence of the system that we undergo daily ; in relation to the violence of the state and its police, who severely repress these demonstrations. For many yellow vests, the violence of the people is legitimate ! And what is the line and the perspective of your organisation about the ongoing resistance ? With the absent of the trade unions and the parties, this movement is a good example of a spontaneous uprising of the people. We had not seen this in France since the riots in working class neighborhoods in 2005. This shows that the exploited do not need organizations to revolt. At the political level, many people understand with this movement that to change things, we will have to take our own issues in our hand. The most combative, the most conscious people ask themselves good questions : the use of violence to achieve our ends ; the question of power too : "Macron resignation ? ", but what will happen after ? However, we can see that the movement is starting to show signs of slowing down. The demonstrations are a little less massive, the claims fish for lack of unity : spontaneity begins to show its limits. Faced with the state and its fierce repression, to overthrow capitalism and really change things, the exploited need a solid fighting organization, and headquarters. In short, a communist party. Our organization remains small, we do not pretend to be this party nor the means to influence the general line of the movement on communist and revolutionary bases. On the other hand, we have the capacity to advance the consciousness of the most combative people, and to reinforce us where we intervene daily, in the companies and the popular districts where we are, as OCML-VP or via work in mass collectives and trade unions. At our level, this is what we are working on in this movement.